How many times in life you experienced headache, heartache, hardship and pain? A love one goes home to glory. The bills are adding up and you do not have a job or money to pay them. Or what about the pain of having an illness or being sick most of the time where it is a never ending battle. You take test after test and go to different doctors or a specialist and the doctors really do not know what is going on with you or how to treat the pain or illness. What will you do when times get rough and hard, when you lose hope and your back is up against the wall? Let me tell you what to do. You hold on to the Lord’s word and you stand on the promises that are in the bible. We all experience tough times in our life where we think in our mind there is no answer or resolution. Some of the problems are other people problems that we take on knowingly and unknowingly, which become burdens in our life. I know it is hard sometimes to hold on to the word of God remain in prayer and faith in order to have peace within in our heart and mind. It is only human to feel weary and give up on life and the dreams the Lord placed in our heart or the assignment and purpose that must be fulfilled in our life. When the Lord promised a nation to Abraham, the Lord specifically told Abraham to leave the country, his father’s house and his relatives and go to an unknown land he did not know anyone so he could become the father of the nation. Where the Lord was going to bless him and make Abraham a blessing to others (Genesis 12:1-2 NLT). Did Abraham question the Lord’s intention? Did Abraham stop believing in the Lord? No! Abraham did not stop believing in the Lord. As a matter of fact Abraham moved out in faith knowing that he could stand on the promises of the Lord by giving up everything he was familiar with in the city he was in. Now think about the calling Abraham had on his life when the Lord told him to move and leave everything. Abraham left immediately without a question or doubt in his mind. 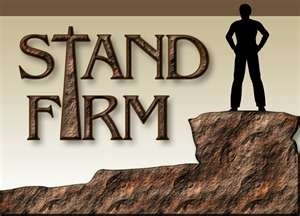 His faith was so strong and he trusted the Lord so much that he knew the Lord’s word could not come back null or void. Some of you reading this article today the Lord has spoken to you and told you specifically to do a task or go somewhere unknown and you did not go or do it. You let the enemy talk you out of the blessing the Lord had for you and only you. The enemy came in and persuaded you not to go, because you did not have what you needed to go. You started thinking and rationalizing with the word of the Lord and what he told you to do. Until the enemy persuaded you enough to tell you, you do not have any money, job, friend, husband, family members to support you or you were going to be alone doing that specific task. Instead of standing on the promises of the Lord told and the blessing he had for you, you let the enemy come in and take your blessing away where you have nothing. Some of you reading this article are just like Sarah, Abraham’s wife. The Lord told Abraham that Sarah was going to have a child and Sarah was listening to the conversation and silently laughed on the inside. The Lord asked Abraham “why Sarah laugh, or say can a woman like me have a baby?” The Lord told her “Is there anything hard for the Lord?” Sarah denied her silent laugh because she feared the Lord she was so afraid and did not say anything else at that time. Sarah told Abraham they was too old and she was well past child bearing years that she could not have any children. Back in those days Sarah was considered to be a barren woman. A barren woman was looked upon with shame because they could not have children. When the Lord promises you a blessing he does exactly what he says. The Lord promised a son to Sarah and even though Sarah was in her 90’s she had a son (Genesis 18 NLT). I was living in an apartment with my children. I was harassed by management every other day. Every time management called I would sweat, get a headache and my stomach would cringe. I instantly was sick. The neighbors made false accusations on my family, saying my son and nephew were causing trouble, hanging with people who sold drugs and intimated maintenance. I knew this was not true. My son and nephew were either working, at school, or at church with the Pastor. It was so horrible. I would fall to my knees and cry whole heartedly to God about my situation. In the midst of my trial and tribulation I continued to stand on the promises of the Lord. I fasted and remained in prayer. I knew the Lord would not leave me nor forsake me. I stood firm on the promises of the Lord. I knew what the Lord said he was going to do in my life and I watched the power of God move. One day the property manager called me into a meeting and evicted my family out of the apartment. With humbleness and grace I asked the property manager to give me at least 30 days to find a new apartment. The property manager continued to say he was taking me to court and the entire situation was out of his hands and to contact his Attorney. Right then I knew I was dealing with a negative spirit a principality I shall say. I knew management wanted to see me act a different way, but I didn’t. I politely told asked him for the Attorney card so I could pass it to my Attorney and then told him to have a good day and left and went to work. When you stand on the promises of the Lord and you trust in Him and lean not on your own understanding the Lord will deliver and give you the desires of your heart. Faith and trust is what pleases the Lord. There are so many promises the Lord has in store for you and in order for you to unlock the door to receive those blessings, or move to the next level in your life, you must trust and stand on the promises of the Lord. Will you stand on the promise today?